The international community and legal luminaries were stunned on 20th March with Kadi Binta’s invocation of Sharia law in her court which was meant to be a court of common law. The sudden probing of Barr. Ifeanyi Ejiofor (counsel to Mazi Nnamdi Kanu) over the limit of his legal study especially on sharia law was indeed a shock to lovers of freedom. Summarily, it could be said that the Kadi Nyako Binta adjourned the case till the next court sitting to enable Barr. Ifeanyi Ejiofor to take a quick study on how sharia law works. What the corrupt judge, whose family members are known for their kleptomania failed to tell the world is what prompted such an unwarranted diversion from common law to a religious law. Is Kadi Binta Nyako now like the biblical Pontius Pilate who having found nothing on the righteous one, chose to do the bidding of the Roman Emperor? Having found nothing against Mazi Nnamdi Kanu before the common law of the land, Kadi Binta chose to fall back to Taqiyya. In Sharia Law, lying is permitted especially against non-Muslims (Unbelievers). That is what the concept of Taqiyya stands for in Sharia Law. The Quran and other Islamic texts encourage Taqiyya as a measure on “non-believers” or non-adherents of Islam. For instance, Muhammed was quoted in Ibn Ishaq, The life of Mohammed, page 307 as saying “ the Apostle said…’who will rid me of Ibnul Ashraf?’ Muhammed bin Maslama, the brother of the Bani Abdul-Ashaf, said, ‘I will deal with him for you, O Apostle of Allah, I will kill him.’ (Muhammed) said, ‘do so if you can…All that is incumbent upon you is that you should try.’) The Assasin) said, ‘O Apostle of Allah, we shall have to tell lies.’ He answered, ‘Say what you like, for you are free in the matter”. In Volume 7, Book 67, Hadith 427, it is stated, “By Allah, and Allah willing, if I take an oath and later find something else that is better than that, then I do what is better and expiate my oath”. Going by this, Kadi Binta Nyako has shown her Islamic fanatism Kanu's case by expiating her oath of office for the promotion of her fanatic support for Sharia. As the above statement has shown, adherents of Islam have no regard for countries constitution or any oath of office when they think such is standing against their Jihad. It is on the premise of the earlier mentioned volume of Hadith that President Muhammed Buhari and Kadi Nyako Binta are standing to rubbish the constitution of the British enterprise (Nigeria) and their oaths of offices. Also in Quran 3 VS 28 is the confraternity call that says “the believers never ally themselves with the disbelievers instead of the believers. Whoever does this is exiled from Allah”. The secular constitution which Nigeria observes, in theory, is viewed by Muslim fanatics like President Buhari to be un-aligning with the dogma of Islam, and any Muslim who either by commission or omission works in favour of the “secular constitution” is seen as allying him or herself with the “unbelievers” and must be “exiled by Allah”. Kadi Nyako Binta is facing so much influence from her inborn Islamic fanatism and the Islamic Buhari-led government and has decided to ruin the country's constitution and her oath of office as a Judge of Federal High Court. This is incredible and unbelievable that the Attorney General of the federation and the Minister for Justice, and the Nigeria Bar association are moping like those under a spell, while Binta Nyako and Muhammadu Buhari render the Nigerian Constitution impotent in broad daylight. To satisfy the wishes of President Muhammadu Buhari and others that she is not allying with the “unbelievers” Binta Nyako advised that Barr. Ifeanyi Ejiofor studies Sharia Law as her ruling to allow masked witnesses stems from the fact. 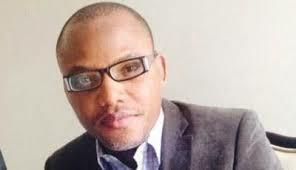 Going by Binta Nyako's judicial somersault, it is obvious that Mazi Nnamdi Kanu is innocent of all the charges leveled against him under the Common Law and that is why she has decided to invoke Sharia Law where Taqiyya will be applied to jail him. In order to gain approval for this perversion of justice, in connivance with some Muslims in Nigerian security agencies, Kadi Nyako Binta was quoted as saying that “those witnesses are security officers and their identities must be hidden”. Sharia Law according to the rules in Taqiyya doesn’t stand against false witnesses against "unbeliever” which Mazi Nnamdi Kanu is seen as. President Muhammed Buhari and Kadi Binta Nyako. The change from common Law to Sharia Law by Kadi Nyako Binta is a mad move by Buhari to Islamise Biafrans. It is time Christians, especially CAN arise to her responsibilities and say no to Buhari’s madness. The International community should also understand that their deaf and dumb approach is not the ideal strategy. Biafrans are ever ready to fight the Jihadists with our last blood and by the grace of Chukwuokike Abiama, we will emerge victoriously.